Highsec is a well-populated place. More EVE players live in highsec than in all of lowsec, nullsec, and wormsec combined. No matter how many people choose to make their home in empire space, the New Order never forgets a face. Agent Mildron Klinker previously reported encountering a dangerous hacker named Th3 s7rYn6. 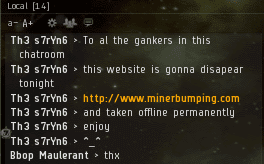 As you'll recall, in retaliation for a Retriever gank, Th3 threatened to take down MinerBumping once and for all. Th3 believed he had forced the site offline several times in a row, but that only someone with high-level access to the website's infrastructure would be able to notice the attacks. As with all of the other doomsday threats against the New Order and its resources, nothing actually happened. Eventually, Mildron and Agent Zane Arnolles caught up with Th3 again. Once again, Th3 lost a Retriever. This time, however, things were different. Since abandoning his cyber-attacks, Th3 had read MinerBumping and perused the Code. The more he read, the more he began to appreciate the Code's potential for improving the quality of life in highsec. 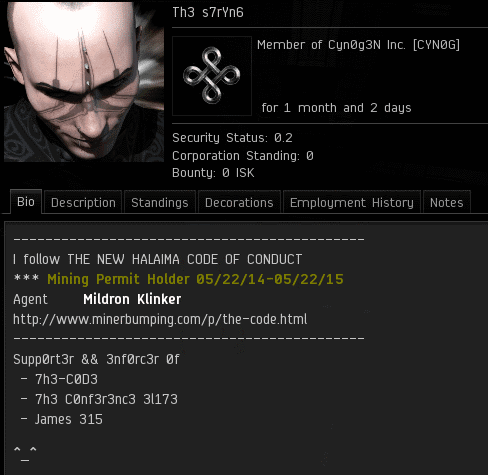 Th3 eventually decided to purchase a mining permit, and to send an additional 100 million isk gift to the New Order. This is yet another example of a recent trend: rebels joining the New Order. 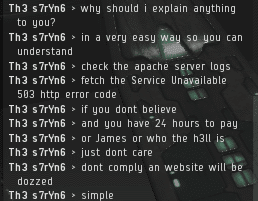 Unlicensed miners of highsec, if a "dozzer" knows to buy a permit, what's your excuse? Holy crap, one plot twist after the other. Am I seeing this correctly????? Recent successes have been VERY impressive to say the least. While that could happen and I hope it does, currently TDD is experimenting with AFK nullsec mining. It is going about as well as you would expect. Well that's a shame. I had my hopes up. Doesn't he get 100 shares and (for now) a place in this month's top ten? I'll never yield to this code nonsense. 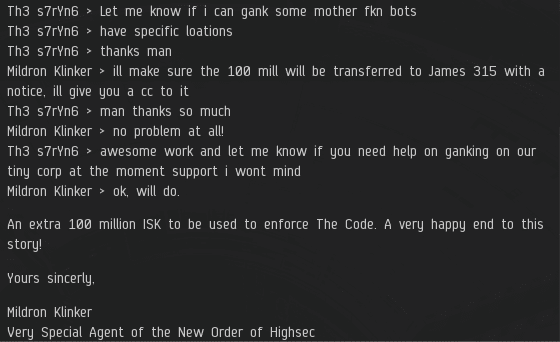 Sad to see so many willing to throw away isk. Bad bad investments. My reason and not an excuse: don't give money to idiots! And yet you buy items off a private market and can then claim ignorance, instead of dealing face to face with people you can actually meet and talk to, in real time. Perhaps if the mining tutorials were given only after an account went from trial to paid, people would be more aware of other game content and less inclined to mine after seeing the vast range of content available to even brand new players and characters, with a few pointers in the right direction. Before anyone claims I don't get how important industry is to New Eden, I can claim to be an industrial character with combat skills currently sitting at 113M SP. Industry is of course very important to the well being of New Eden, however it's not the start and end of the life of a pod pilot; at least it shouldn't be, but mining represents near instant isk, very little risk and game play that borders on a sleep inducing drug. Add in the bad CEO's who teach new players that mining and running missions are the only content to the game while profiting of new players inexperience, and that leads to many account lapses. Pay for a permit, claim your support, live up to the ideals that you want to see in a multiplayer game that crosses geographic, political, religions borders and of course time zones. Or do the opposite and create content that way too. Just don't bury your head in the sand and claim ignorance in a game that exists out of the software client.